In books, a character has her epiphany moment in the last chapter, learns some important truth about the nature of the universe that will help her live her life in a whole new way, and the book ends there. In life, we keep learning the same lesson over and over and over again. Here is the lesson I learned for the 500,000th time this morning: I am happier when I write. Now, I knew this. I like to talk about my "four pillars of happiness," the four corners of the sturdy foundation on which I can build a happy life: writing, reading, walking, friends. A day with those four things in it is a good day. All four are within my control. I need not wait for the approval or kindness of the fates. I can just write, read, walk, and pick up the phone. And yet I spent most of yesterday, a glorious snow day, depressed as I slogged through extremely frustrating work trying to locate art for my University of Maryland publication (not just FIND art, but find art for which I could obtain permission to publish - there are TONS of images all over the Internet with no publication credits whatsover! - and then I had to figure out how to GET the permission and then actually GET it - but enough of this horror story!). Why didn't I take just ONE hour of that day, preferably the first hour, and write just one page of my book? I did that this morning, just finished doing it - and oh, the difference it makes! Now I'm ready to climb mountains, swim seas, deal with my car repair woes, tie up the last onerous details on this publication. That's all it took: writing one page. Lesson to self: You are happier when you write. Lesson to self: Don't forget this! You are happier when you write. Yesterday was a series of one terrible thing after another. First, those car repair woes I blogged about yesterday. Staggering under the weight of that suffocating sadness, I turned on my email, thinking maybe the universe would decide that this was the day to send one tidbit of good news to Claudia. And - wait - there in my inbox was an email from the editor of a journal to which I'd sent a children's literature article last spring - I had gotten one reviewer's comments, did a major revision, sent it in - and just enough time had gone by that this email should be the editor sending me my acceptance!! But - no!!!!! It was the editor saying that there had been a "mixup" and I was supposed to have gotten a set of comments from a SECOND reviewer, and he had just found them, and here they were. As in: time to start the revision process all over again. And THEN, when I checked my email later in the day, in desperate search for even the teensiest scrap of something to make my life worth living, there was an email from the University of Maryland, politely inquiring when I was going to FedEx them the proofs for the quarterly publication I'm guest-editing: the proofs that I had already Fed-Exed them last Thursday! And were apparently lost, to be laboriously done all over again, because of course I hadn't made a copy, as Fed-Ex never loses anything. This was, to quote Judith Viorst, a "no terrible, horrible, no good, very bad day." But today, inexplicably, everything is better. The car repair place swears up and down that after hours of exhaustive checking (for which they did NOT charge me), they are POSITIVE that my head gasket is not leaking, and the previous appearance of leakage was just caused by "residue" from the earlier repair. The editor of the journal emailed me to assure me that he wasn't expecting a major overhaul of the article, just a tweak or two: I can do tweaks! I verified that my Fed-Ex package had indeed been delivered to the University of Maryland on Friday; the production guy there found it and already make the changes and emailed the new proofs to me. And it is snowing!!! Ten to eighteen inches forecast, and probably ten on the ground already. Gregory didn't have school; I did, but my classes were all in festive snow-day mode, and the university closed early. All my brownies and Jello from yesterday's attempt at self-comfort are long since eaten - so maybe now some celebratory apple crisp? The news about my car is very bad. That engine check light? The one I hoped was nothing because it DID come on for the first time only after I had failed to screw the gas cap on until it clicked? It isn't nothing. It means the catalytic converter needs to be replaced, a repair that MIGHT cost me $1200 if all goes well, but could cost double that if all doesn't go well - and which scenario do you think is more likely? Oh, and this is the ONE thing that isn't covered by my warranty that was sold to me on the promise that it covers absolutely everything. Moreover, while the mechanics at the Subaru dealer were investigating the engine check light, they also discovered that the head gaskets are leaking oil. Badly. Fixing this problem was the repair that I just had done on the car a couple of weeks ago, at the dealership where I bought the car in the first place, the dealership across the street from the Subaru dealer. Apparently the repair needs to be done over again. And it has to be done by the same shop that screwed it up before, as this repair WAS paid for by the warranty, and the warranty people aren't going to want to pay for it twice. And I don't feel like paying for it, either, as it was another $1000+ repair. But I also have a BAD FEELING about having the repair done over again by the same people that screwed it up the first time. I am just the teeniest bit crabby! Just the teeniest bit tilting toward hideous, soul-crushing despair! A couple of years ago I heard a fabulous talk at an SCBWI conference (Society for Children's Book Writers and Illustrators), by local author Laura Deal. I've never forgotten it. Talking about the vicissitudes of the writing life, she shared her belief that "Activity is the Antidote to Anxiety." Keep writing. Keep submitting. Keep doing SOMETHING. So last night, overcome with my misery, I graded all the midterms for my little freshman class: done! I finished reading the last of the five books I have to review this month for Children's Literature. This morning I paid bills, did a big wash, caught up on email, made Jello, baked a pan of brownies. Now I'm blogging. Then I'll try to write a page on my chapter. My car is falling apart; repair bills are staggering; battles with the bad repair place await me. But at least right now I have clean clothes. Midterms all graded. And Jello. I'm home from my delicious three days at the feminist philosophy conference at the University of Washington. The conference was stimulating and inspiring, especially a paper by my favorite contemporary philosopher in the English-speaking world, Cheshire Calhoun. Cheshire Calhoun writes on the most interesting possible topics in the sub-area of philosophy known as moral psychology. She has a fabulous essay on forgiveness, called "Changing One's Heart" - and one on integrity, called "Standing for Something." She's written on civility and decency - such wonderful topics! Her paper for this conference was on boredom. Nothing could be less boring than a paper by Cheshire Calhoun on boredom. What does it say about human beings that we have a capacity for boredom? Why does boredom lead to "normative delinqency" (all that bad behavior that we do when we're bored: drinking and eating too much, throwing spitballs at the ceiling)? Why does repetition of a familiar pastime generate boredom rather than contentment? Cheshire had fascinating speculations on all of these. I love Cheshire Calhoun so much that at one time I was the founder and president of the Cheshire Calhoun fan club. The club had other officers and members, too, so I wasn't the only one. We had meetings, and minutes from the meetings, and we even had letterhead, with the Cheshire Cat from Alice in Wonderland on it. I have to admit that we haven't had a meeting in a while. But maybe it's time for another one. When I was a judge of the National Book Award in 2005, in the category of Young People's Literature, people would sometimes ask me what my qualifications were for the post - and wasn't I nervous being entrusted with the responsibility of conferring such a major award? But all I had to do as a judge was read a few hundred books and find the one I loved best. And I've always been excellent at loving. Loving is one of the things I do best. As part of my massive, get-my-whole-life-in-order preparations for my little three-day trip to the University of Washington, I balanced my checkbook last night. I love balancing my checkbook. If there is anything that makes me think that my whole life is in order, it is getting out my calculator and figuring out exactly how much money I have in my checking account, right down to the penny. But the problem is that so often it doesn't balance! I keep such careful records in my checkbook register, and yet almost NEVER does the bank come up with the same amount that I come up with. I go back and double-check the amount of every single check, deposit, ATM withdrawal; I recalculate every addition and subtraction; and the numbers still don't match. I subtract the bank's number from my number (and always, it's the bank's number that's smaller), and the number I get is never some nice round number like $50.00, where I can go back and look for a $50.00 error somewhere. It's always something like $183.47. I try to search some more - but what more can I do other than check every single figure recorded in my checkbook register and every single calculation? So then I give up and write a correction line: CORRECTION $183.47. And I mark it with a frowny face. This has been going on for months. But then last night, o miracle, the checkbook balanced! My number was the same as the bank's number! This has to mean that every single correction I made for every single one of the last ten months or so was the correct number. It implies a staggeringly huge series of correct calculations, well, at least correct calculations as to the amount of my previously incorrect calculations. I marked this with a VERY big smiley face. My checkbook is balanced! My life is in order! I can now leave on my trip! I leave tomorrow for a delicious three days at a feminist philosophy conference at the University of Washington in Seattle, a conference organized to celebrate the 25th anniversary of the feminist philosophy journal Hypatia. The papers and panels promise to be excellent; the whole conference will be a huge, memorable "happening"; and best of all, I'll be staying with a most-favorite-ever former graduate student and reconnecting with several other most-favorite-ever former graduate students. But there is so much to do between now and then! For some reason, when I'm about to leave for a trip, I feel that I need to do everything possible before I go to put my affairs in order, clear my desk, leave with a light heart and a clear conscience. This is fairly ridiculous, as I'm only going for three days! And during those three days I probably wouldn't have accomplished all that much even if I had been at home. Everything I'm trying to get done today could wait until I return. There is no reason why it HAS to be done today. And yet - it would be so lovely to get on the plane tomorrow with the proofs processed and sent back for the University of Maryland publication I'm guest-editing . . . and those recommendation letters in the mail . . . and the cheesecake purchased and in the freezer for Gregory's birthday . . . and another chapter done of my book. Wouldn't it? I start every day by reading Garrison Keillor's Writer's Almanac, which comes to me over email. You can subscribe to it for free, and I'd recommend it most highly. Each installment comes with a poem, and it's always an accessible, readable poem, not one of those poems where you have no idea what it even means. And then you get a few little tidbits about literary anniversaries, memorable quotes, glimpses into famous and not-so-famous writers' lives. Today I particularly liked this quote from poet and essayist Robert Pinsky: "Whatever makes a child want to glue macaroni on a paper plate and paint the assemblage and see it on the refrigerator — that has always been strong in me." Yes! I love how this speaks both to the creative impulse in all of us - the desire to mess around with gluing and painting that macaroni - but also the equally strong desire to share what we have made for the appreciation of others: look at what I made! Last night my writing group met and I shared the new beginning of the new book, the one that I already knew they would like because I had emailed it to Leslie as soon as I wrote it and she had given me her praise and encouragement. So I could settle in and savor the pleasure of having them like it. One of the best things about our writing group is Marie's laugh. Sometimes I think my only goal as a writer is to make Marie laugh, because Marie's laugh is such a wonderful thing. And last night she did laugh during my chapter, not once but several times. She loved my glued and painted macaroni. She did! 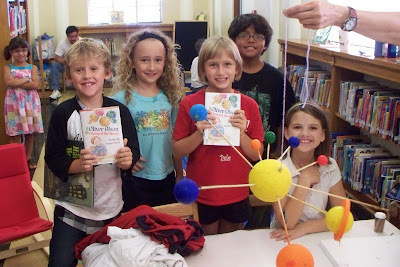 I was thrilled to get this photo of kids at the San Pedro Park Library in San Antonio, Texas, who have been reading my book How Oliver Olson Changed the World and making their own model of the solar system to go with it. In the book, Oliver and his classmate Crystal make a "protest diorama" on behalf of poor ex-planet Pluto. While Pluto doesn't seem to have made it into this solar system model (I count only eight planets there), I've been assured on good authority that the kids did spend time arguing the pros and cons of Pluto's status as a planet - and after all, Oliver and Crystal do end up changing their mind about Pluto before the book is over. I particularly like the bright orange ring around Saturn. Oh, and the TWO copies of my book. And of course, most of all,those smiles. So here's the puzzle. In the evening, before I go to sleep, all I can think about is how eager I am to leap out of bed the first thing the next morning, fix myself my Swiss Miss chocolate, and sit down to WRITE! And yet, when the next morning comes, all desire to do this has suddenly disappeared. How can this be? As so often happens, my beloved Barbara Sher has an explanation. In Live the Life you Love, she calls this "resistance." She says it's in our genes, a holdover from our Cave People days: "If there was one thing Stone Age people didn't like, it was adventures into the unknown." She says we're genetically programmed to stay inside the cave, safe and fat. Resistance gets nervous when we dare to take creative risks, follow our dreams, creep out of the cave toward the light. But Sher says we can trick resistance. The only thing stronger than fear, Sher says, is love. So our trick has to be to "find the smallest unit" of this thing that we love, "a unit of activity so modest that it doesn't trigger resistance." If you're a runner, this means putting on your running shoes and just walking around the block. If you're a writer, this means reading over what you wrote yesterday and writing just one more sentence. Then, love for this "smallest unit" will "pull you right out of your inertia dream." You'll remember: but wait, I love running! I love writing! And the next thing you know, you'll be three miles into your jog, halfway through a new chapter. Of course, then you have to do the whole game of cheating resistance the next day, and the day after that. But it does get easier each day, I think. At least a little bit easier. Writing this blog entry this morning has been my "smallest unit." Now I remember: oh, I do love to write! Now I'm going to go read over that chapter I wrote last week, the one that was a whole new direction on my failed manuscript, and I'm going to think up some hilariously funny things that can happen in chapter two. No, too scary! Okay, I'm going to spend just thirty minutes thinking of anything at all that can happen in chapter two. Sher says that the goal is just to "sit by the side of the lake and dangle your feet in the water for a while." And then, she promises, "At some point that delicious little bit of water around your feet might make you want to swim more than you want to be warm." There are many kinds of days that can be called wonderful. Here is the kind of wonderful day I had today. It started off with my finding out, yesterday evening, that the one obligation I had in the middle of the day was cancelled. This was to have been a lovely fun time mentoring an aspiring children's book writer, so a day with that in it would also have been a wonderful day. But sometimes I have found myself thinking that there is nothing in my life that is so much fun that it wouldn't be even more fun to have it cancelled. So I had a whole entire day to be at home and work, puttering at my desk. I kept my nightgown on until 4:00. During the morning as I worked I ate a Pepperidge Farm apple turnover, hot from the oven, and a glass of milk. During the afternoon as I worked I ate little bowls of the lentil soup I had simmering in the Crockpot, one bowl every couple of hours. I got so much acomplished! I finished writing the talk I'm going to give next week at a feminist philosophy conference at the University of Washington in Seattle: a talk on what exactly is wrong about parents' favoring one child over another, for a panel on ethical issues in everyday mothering. I even sort of liked the paper when I finished writing it. It had some beautiful little bits in it about the difference between two kinds of love: being loved-for-reasons and being loved-without-reasons. I wrote not one, not two, but THREE recommendation letters for graduate students going out on the job market. I sent off two poems to a campus literary magazine. I sent off a blurb for a talk I'm giving at the Undergraduate Ethics Symposium at DePauw University in Indiana next April, called "Divine Love and Moral Arbitrariness." It's about love, too, God's love this time. I even got into my bed for a while in the afternoon and didn't EXACTLY take a nap but thought about how good it felt to be in a warm bed in a chilly room - and to be there at three in the afternoon. Parental love, divine love, an apple turnover, lentil soup, and a quasi-nap. What is not to like about such a day? Some people love to save things; other people love to pitch things. Often they marry each other, which makes for terrible household strife. I'm someone who loves to throw things away. I've always been that way. As a child, I would play a game with my sister; for some reason, the game was called "Sister Sue." I'd be Sister Sue, and I'd clean up my desk and get rid of heaps of stuff and give it all to Cheryl. To this day, she has heaps of stuff. She's the one who still has all our old 45 speed records ("Cherish," by the Association; "Downtown" by Petula Clark); she still has the Unisphere pencil sharpener we each got as a souvenir from the 1964 New York World's Fair. I have hardly anything. As far as stuff goes, I live an unemcumbered life. Barbara Sher, in Live the Life You Love, gives the following tip for getting rid of clutter: "begin a small, relentless ongoing program to throw out ten things from every room as often as you think of it. If you're combing your hair in front of the bathroom mirror, bring the wastebasket closer, open the medicine chest and find ten things to throw out while you keep brushing your hair: your cousin's shaving cream, that outdated prescription you wouldn't dare to touch, those old vitamins." Oh, how I wish I could! But it's already gone, all of it. It might be worth getting some clutter just for the fun of getting rid of it. But accumulating clutter simply isn't in my nature. I even love deleting emails. When I go on a trip I'm wild to check my email, not so much because I want to read any of it (though there is always hope that I'll get an email announcing that I've won some major, prestigious, lucrative award), but because I love deleting it so much. I adore having a tidy inbox. In fact, another email or two may have come in as I've been writing this. More to delete! And then maybe I'll just look in the medicine cabinet. There probably isn't anything there I can throw away. But just in case. . . . So after getting rid of my poor little 1991 Corolla and having major work done on my only remaining car, my 2003 Subaru, spending almost $1000 despite the fact that I already paid for an expensive warranty for the vehicle when I bought it last spring, this afternoon THE ENGINE WARNING LIGHT CAME ON! I can't believe it! Now what am I going to do? And of course, this does make me wonder if maybe this is a sign from the universe heralding the beginning of the end of all good fortune for me, the first premonition of my long slow decline. not to mention the rest of my life. though it strongly suggests that possibility. Yesterday evening I went to a little party hosted by two of my undergraduate students, Scott and Meredith: the point of the party was for the guests to curl up cozily by the fire, many of them wearing their footie pajamas, while I read to them from my children's books. Scott and Meredith were the only two people there whom I knew - the rest were their friends, who had no particular reason to want to come to hear me read, except for the age-old hankering all of us have for the sheer pleasures of story. And so I sat there and read, choosing what I thought were my best, funniest or maybe most touching, bits (the scene in You're a Brave Man, Julius Zimmerman where Julius tries and fails, in his summer French class, to do le hokey-pokey - the subsequent scene where he has to change a poopy diaper for his little babysitting charge, Edison Blue - the scene in How Oliver Olson Changed the World where Oliver's parents squabble as they try to make his third grade diorama on the solar system - the opening Monopoly game scene in The Totally Made-Up Civil War Diary of Amanda MacLeish - the closing scene in Being Teddy Roosevelt when Riley finally gets a saxophone of his own. I felt like Scheherazade, only a happy, contented, not-at-all-nervous Scheherezade. I thought: this is why I write stories, so that somebody, somewhere, can sit reading them aloud by the fire - maybe so that I can be the one to sit reading them aloud by the fire. I also thought how fun it is to be young, and to live together in a little apartment, with gym shoes strewn everywhere, and wonderful food like blueberry cornbread and home-made brownies - surrounded by good friends, and maybe to be curled up in your footie jammies next to someone you love - and I know they were all thinking how fun it is to be even younger, a little child ready to be tucked in to bed, hearing one last story read in a mother's soft voice. Last night, it was all fun, every single minute of it. My tough perceptive writer critic friend read the new beginning of the completely new book and she loved it. I had been nervously checking my email hourly to see if there was a post from her giving her verdict (when will I ever stop doing these things to myself? ), and then the email came, and she said, "I really thought this was great. It totally cracked me up." As soon as she said it, I realized that I had known that was what she would say. Sometimes I think authors are terrible critics of our own work - but most of the time I think we're actually pretty accurate self-critics. When something isn't working, we know. When we're on fire with our red-hot creative hotness, we know that, too. Twyla Tharpe has a great discussion of "ruts" versus "grooves" in her totally wonderful book The Creative Habit. She gives three steps for dealing with ruts. First, you have to see the rut. Second, admit you're in a rut. The third step is getting out of the rut. She says that the third step is the hard part, but this time for me it was the second step that was the hard one. I saw the rut, saw it only too well, but was in resolute denial about it: maybe the book would find itself in the next chapter, or the chapter after that. . . . this was only the first draft. . . it was still better to be writing something than nothing. . . . When I finally admitted the rut - THIS BOOK IS NOT WORKING! - the next step - WELL, STOP WRITING THIS ONE AND START WRITING SOMETHING ELSE! was suprisingly easy. Oh, I hope I'm in a groove now! Because, as Twyla says, "A groove is the best place in the world." I made my decision: I'm abandoning the manuscript even though this draft is 80 percent finished, with 8 of 10 chapters done. I've gone with the wisdom in my friend Ina's advice: "Just because you've begun a mistake, you're under no obligation to continue in it." I spent some time reading reviews of very successful chapter books online - books that are much more successful in terms of criticial acclaim and commercial success than mine - and realized that the book I was working on just wasn't BIG enough, BOLD enough, BRAVE enough. So then I spent the afternoon starting a completely new book, with the same characters, but this time they are much funnier because they are doing much funnier things. The story came pouring out of me - I never wanted to stop. I was laughing out loud as I wrote it. I read the chapter to my son at dinner (over his objections - does any seventeen-year-old really want to hear his mother read aloud to him her new chapter that she thinks is so very funny?). He did chuckle in a couple of places. Maybe he was just humoring me. But still. I've emailed the chapter to one writer friend who in the past has been an extremely tough and perceptive critic. I'll see what she says. Is this the tree that I'm supposed to be barking up, or not? If she says not, I'll take her opinion very seriously and probably start barking up tree number three instead. But, whatever she says yesterday afternoon was wonderful. I wrote something I loved, and I loved the sheer act of writing it. That counts for something. It really does. My new book is not working. I shared two more chapters with my writing group last night, and they confirmed this. Yes, there are some comic moments, some funny lines, even some dramatic tension. But the basic premise of the book needs work, major work; at the least, it needs a complete and total overhaul; maybe it isn’t even salvageable and the whole project needs rethinking. So here is my question: should I finish writing this draft of it, anyway? In favor of continuing: it’s just a DRAFT, and it’s only by actually sitting down and doing the writing that I can see what’s working and what isn’t. Plus I AM generating those comic moments, those funny lines, and those plot developments that for me seem to emerge only when my pen is actually on the page, not when I walk, or sleep, or take a shower. Elizabeth Yates, in Someday You’ll Write, whose book on writing that I loved so much as a child, says, “Unfinished work is discouraging. It is a downward drag from the high course you have set.” And I so adore crossing things off my list: first draft, done! But starting again before or after I finish this first, fatally flawed draft? Every October my friend Rowan and I go to tour Boulder's fabulous Open Studios: a program that invites the public into the studios of hundreds of local artists for two consecutive weekends. Yesterday we visited sculptor Alison Small, who creates her works from mountain-hewed stone as she gazes out at stunning views of our Boulder mountains - water colorist Anne Gifford who designed the artwork for this year's world-renowned Bolder Boulder 10K race- quilter and fabric artist Carol Watkins, and three others. I love to be in the space of so much beauty and creativity in one afternoon. It's wonderful to see the art, of course, but even more wonderful to enter the world of the artist: to see how artists create not only their art, but the conditions under which they can create their art. I fall in love not only with their work, but with their whole lives. Take Carol Watkins. She has spent time as an artist-in-residence at Mesa Verde National Park and at Rocky Mountain National Park - living in the parks in park cabins for weeks at a time to soak up inspiration for her astonishingly detailed and beautiful quilts and thread paintings. Oh!Now I want to be an artist-in-residence in a national park. Don't you? I came home and looked at my own little office with a more critical eye. I do love it, love it dearly - but does it exude creative joy like the spaces I visited yesterday? Can I do anything to enhance its potential for creative joy? For one, I'm going to stop calling it my office and start calling it my studio. And then I'm going to Google "artist-in-residence national park" and see what I can find. One of my jobs is being a neighborhood rep for the King Soopers grocery gift card program for the Fairview High School bands. Band families commit to buying so many gift cards a month; I take their order and submit it to the head King Soopers gift card lady; she gets the cards (thousands and thousands of dollars worth of them), delivers them to me, and then I deliver them to the dozen band families on my route. For two years I myself was the head King Soopers gift card lady. I was only moderately successful at the job. It involved all the things I am worst at: Excel spread sheets! Math! Several times the bank called the band treasurer to tell her that there was a mistake in my deposit. This seemed impossible to me: how can there be a mistake in an account done on an Excel spreadsheet? Well, it seems that there were many mistakes in accounts done on Excel spreadsheets by me. But I am an excellent neighborhood rep, one of the best. I used to make my rounds in the car, first calling around to make sure families were home (Saturday morning right at 9 is best - people are up, but not yet out). It took about an hour and wasn't too onerous. Now I do them on foot. It takes hours and hours, but is tons of fun. I just delivered to six families this evening, walking from house to house in the golden glow of an October evening, carrying my King Soopers gift cards in my little basket. I was wearing a long, full, red plaid skirt that I bought at the Fairview band yard sale last month for a dollar, paired with a black sweater I bought there for another dollar. It was quite blustery tonight, so I also had on a hat and mittens. I felt so perky! So plucky! So adorable in a 50-something way. In a month or two I may be delivering my King Sooper gift cards with my little basket in the snow. Even perkier and pluckier! But neither rain, nor sleet, nor gloom of night stays this band mom with her little basket from the completion of her appointed rounds.